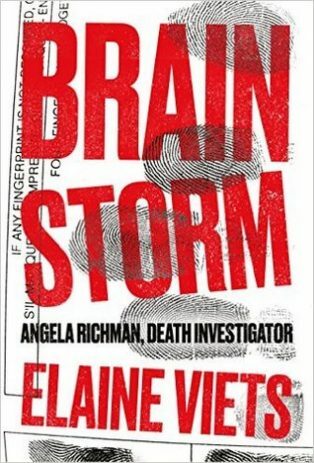 I received Brain Storm in a goodreads giveaway. My thanks to goodreads, the author for making the title available for the giveaway and to Lady Luck. I expected something different than what I received when I started reading Brain Storm, but I will try to keep my prejudices at bay. Angela Marie Richman lives in Chouteau Forest, a wealthy ghetto some thirty miles west of St. Louis. She investigates all the deaths in the county— murders, accidents, and overdoses— that don’t happen under a doctor’s care. Chouteau County is about ten square miles. Its main town, Chouteau Forest— the Forest, to insiders— is mostly estates. And Chouteau, if you’re local, is SHOW-toe. I would hate to live in Forest – The author painted a vivid picture of an old money community that turned my stomach. A place where some would rather be a small fish, than a big one pretty much anywhere else. The Forest believes in ancestor worship. They know his great-grandmother and his grandmother were Daughters of Versailles queens, and his mother was a maid of honor. They know that his grandfather, a famous surgeon, helped found SOS. And they’d rather die than go to a better doctor. This was the Forest, where appearances mattered more than facts. I like Angela. She was believable as a death investigator (not that I’ve ever met one). She was ballsy, but not too super hero-ish. At one point she takes a crazy risk that I disagreed with, but the argument could be made that since she had a brain injury, she wanted to assure people that her cognitive skills were improving and dispel any thoughts that she was going crazy. Katie is her amazing best friend. Someone that has Angela’s back in the most trying of circumstances and has no qualms about laying into her if Angela’s mucking things up. For some reason I found the detective, Greiman, to be over the top – I was perturbed by his cartoonishness. My jaw would clench and I’d be knocked out of the story whenever he opened his mouth. I wanted to punch him so badly… Later in the story, a lame reason was given for his behavior. One thing that I found annoying were blocks of conversations were repeated throughout the book. Again this could be the author’s way of putting us in the mind of Angela who was dealing with loss of memory. Don’t know if this was the reasoning behind the repetition, but I felt that the author thought that the reader wouldn’t be smart enough to recall the conversations. The book started to get interesting at the 85% mark. Up until this point, the only memorable scene for me was a dinner Angela had with friends; it was touching and I actually said, Awww, out loud. Part of the ending was predictable. There is an earlier scene that screamed, ‘this is how I will do it’, as I was reading it. Vague enough for ya? This story didn’t move me. With the exception of the aforementioned dinner, I did not laugh out, scream at Angela not to go in there or close my eyes because they were about to get her. While I was nowhere near dnf-ing this story, I did have to force myself to keep reading so that I could leave a review, sooner rather than later. Three stars because maybe I sucked at hiding my prejudices. I would like to read some of the author’s award-winning works.